This page contains a list of our most commonly received questions. Contact us if you have a question related to this website for which you can't locate an answer. Q. How do I become a community member? A: Click here to become a more active participant in our community, to submit reviews, to engage on YardTalk and more!. Q. What is an heirloom variety plant? A. An heirloom plant is any type of plant, or cultirvar, that was grown in earlier times, before large-scale agriculture. Q. Which are my best organic herbicide and pesticide options? The easiest way to answer this question is to reference you to our table on this page. However, remember in addition to applying substances, free ranging poultry will significantly help with many pest problems. Q. My chickens stopped laying - what could be the cause? 1. Heat - chickens do not do well with high temperature and high humidity. Put a fan in the coop if you don't have one already and make sure htey have plenty of wtaer. This will not necessarily guarantee they return to laying, but will make them more comfortable. 2. Molting: chickens molt at about 18 months of age. During their molt they will not lay for approximately 4 to 6 months. For this reason you may want to consider acquiring your chicks in staggered batches so not all of them turn 18 months at the same time. For example, in an urban area that allows you to have a Maximilian number of 6 chickens, acquire 3 chicks in the first spring and 3 in the next, You can also purchase mature or near-mature hens, but it's difficult for many people to discern the exact age of a bird, so buy from a reputable source. 3. Old age. Some chiciken breeds will start to slow down production as they age, but not all. Consider this when making your breed selection. 4. Health and diet: are your birds healthy and getting proper nutrition? Be sure to use a good quality commercial layer feed for your hens. Q. What causes blood spots in an egg? A. Occasionally, a capillary bursts near the egg sometime during ovulation or formation of an egg. This causes a small blood spot to appear. Though the industry takes steps to prevent eggs with blood spots from reaching the supermarket, occasionally blood spots are found in eggs produced for the commercial market. These eggs are completely safe for consumption. Q. Why are some eggs double yolked? A. On occasion, two ova are released into the oviduct at the same time, creating an egg with two yolks. This is not an uncommon occurrence, especially in younger birds and birds who lay especially large eggs. 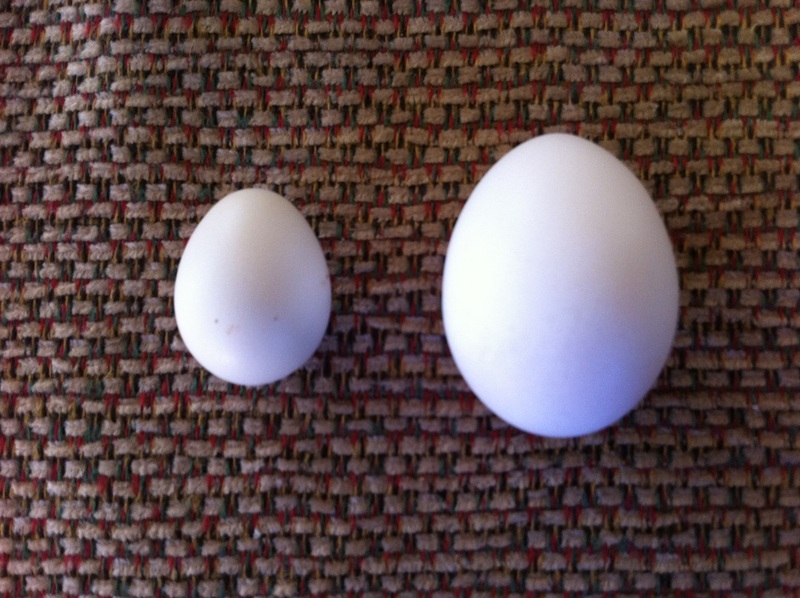 Q. What’s the difference between white eggs and brown eggs? A. The color of an eggshell is determined by the breed. White chickens lay white eggs and red chickens generally lay brown eggs. The color of the egg has no effect on flavor or nutritional content. Q. Why eggs come in different sizes? Q. My hens have lost feathers on their bottoms. Why? A. This is one to watch very closely. Feather loss is frequently a result of molting, but not always. Sometimes when a hen passes an egg that is larger than her body may be reach for, a bit of blood may appear on the egg shell. However, if streaks of blood appear on the egg and on her bottom, you likely have a feather picking and/or bullying problem occuring in your coop. Immediately isolate the bird with feather loss from the other birds. Once a bird has blood on its body, the other birds will be attracted to it. If you allow your injured hen to stay with the other birds, there is a good possibility your hen will be dead within a few days, so immediately removing her and cleaning the injured area with an antiseptic wash is critical. 1. Stress from overcrowding. Minimum space requirements are just that, minimums. Make sure your birds have both enough floor space to scratch around as well as roosting space. Check your birds at night and make sure there is ample space for every bird who has a desire to be on the roost to do so. Some birds will prefer to sleep in nesting boxes - not desirable for you since that's extra cleaning of the boxes - and young hens may not yet be able to get all the way up to the higher roosts, but other than those reasons, all hens should have a space on the roost. Over crowding of the roost can often lead to bullying. 2. Nutritional deficiencies, most typically protein deficiencies. These will sometimes lead to feather picking and consumption of the feathers. If you see this occurring, increase the protein in your hens diets. 3. Learning bad behaviors. Most animals are vicarious learners and once one hen sees another hen picking feathers or bullying her, there is a high likelihood the others will join in. Remove the offending hen from the coop or range area immediately, If other hens have also learned this behavior, carefully watch the remaining hens behavior with uninjured hens to monitor their behavior. In worse case scenarios, if you have a number of repeat offenders, you will have to cull the hens. 4. Boredom. In some cases your hens may just not have enough to do. Consider adding in leaves, additional protein sources, hanging apple halves from strings to give them something to peck at and occasionally offer cut grasses as available to give them matter in which to scratch. Q. My eggs have blood streaks on them? A. This is likely a sign of feather picking and chicken bullying. Sometimes when a hen passes an egg that is larger than her body may be reach for, a bit of blood may appear on the egg shell. However, check all your hens to see if one or more of them may be missing feathers on their bottom around their vent area. If so, immediately isolate the injured hen and observe your hens behavior to determine the cause. Please see Q. My hens have lost feathers on their bottom. Why? for more information. Q. How can I add more protein to my chickens' diet? A. You can purchase higher protein feeds, including chick starter. Some supplements, such as blocks, are also designed specifically to increase protein. Another important source is nature. Do you have an area of soil that you can turn up and allow the chickens to scratch around in and allow them to look for their own insects. Grub worms, meal worms, grasshoppers and earth worms are all chicken favorites. Q. My does aren't producing as much milk as they typically do. What could be causing this? A. There are a number of factors that will effect how much milk your does are producing. Mature does are able to reproduce their entire lives and milk production is not typically effected by age. The most important influencer with regards to age is you want to be sure your doe's kid in their first year of maturity or this will likely effect their milk production the rest of their lives. The amount of water the doe is drinking will greatly influence the amount of milk she produces. If for whatever reason the does do not have access to as much fresh water as they require, milk production will be impacted. Heat is another factor. Some goat breeds are reportedly effected more by heat than others and it is not uncommon to notice lower production on particularly hot days. The lactation cycle may be coming to its natural end. A doe in the wild would eventually need to wean her kid to build her body's reserves from her kids to be born the following spring. It is recommended that does get at least two months off every year from milking, but you may decide to stop milking sooner depending on how much milk you are getting from the doe.